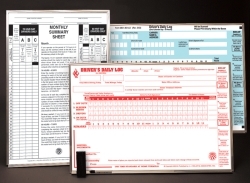 The Monthly Log Summary Melamine Board Chart with Aluminum Frames 8570/809-R is an enlarged monthly log summary sheet. It shows 70-hour/8-day or 60-hour/8-day sheet for flexibility with all J.J. Keller stock logs. This oversized monthly summary log is a great tool for your drivers training and you can reuse it again and again. The oversized chart comes with an aluminum frame with wall hooks for mounting, and includes a marker, eraser, and oversize log ruler.